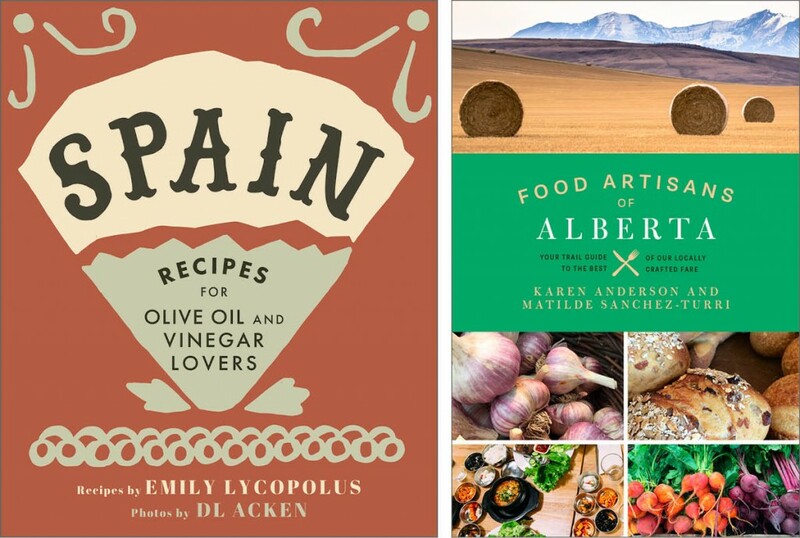 TouchWood Editions is pleased to announce that Spain by Emily Lycopolus and DL Acken, and Food Artisans of Alberta by Karen Anderson and Matilde Sanchez-Turri have both won Canadian Gourmand Cookbook Awards and have advanced to the Gourmand Best in World Cookbook competition. Spain: Recipes for Olive Oil and Vinegar Lovers by Emily Lycopolus, with photographs by DL Acken, was awarded the Best Canadian Cookbook in a Series. It is the third instalment in a set of hardcover small-format cookbooks that showcase the surprising and versatile ways that at-home cooks can use high-quality olive oils and vinegars to easily spice up their mealtimes. Other cookbooks in the Recipes for Olive Oil and Vinegar Lovers series—available singly and as a box set—are Italy, Greece, and Syria. Food Artisans of Alberta: Your Trail Guide to the Best of our Locally Crafted Fare by Karen Anderson and Matilde Sanchez-Turri was awarded Best Culinary Travel / Food Tourism Book in Canada. With profiles and stories from more than 200 food artisans, this book helps travellers and locals alike discover the distinct tastes of Alberta beyond the province’s seven signature foods, and introduces breweries, meaderies, distilleries, cheesemakers, and more. Founded in 1995, the prestigious Gourmand World Cookbook Awards receive submissions from more than 200 countries each year and award prizes in more than 100 categories. In the first leg of the competition, cookbooks and wine and drink books compete against titles within their country. Having won in Canada, Spain and Food Artisans of Alberta were automatically entered to compete in their categories against winners from other countries in the Gourmand Best in World competition. Results will be announced at the Macao International Book Fair in Macao, China this July. Emily Lycopolus is the author of six olive oil-focused cookbooks, a level two olive oil sommelier, co-founder of eatcreative.ca, and founder of The Olive Oil Critic. Her family owns an olive grove in central Italy, where her love of olive oil began. She lives in Victoria, British Columbia. Danielle (DL) Acken is a Canadian-born international food writer and photographer who splits her time between London, UK and her farm studio on Canada’s beautiful Salt Spring Island. See her work at dlacken.com. Karen Anderson is a Taste Canada award-winning cookbook author and owner of Alberta Food Tours. Anderson also leads annual cuisine and culture trips to India. Matilde Sanchez-Turri was raised in Southern Alberta in Claresholm and on a farm near Nanton. She is a corporate communications professional, and also works at Alberta Food Tours. They both live in Calgary, Alberta.